Tryphena is dead, evil Berenice and her dark demon god hold the Pharaoh’s throne – so Cleo must flee the city of her birth and seek out her patron goddesses before it’s too late to save Egypt. Not only must she make her way across the desert to restore Isis’s power, but her goddess also commands her to raise two armies before taking ship across the Great Green Sea to find her exiled father in Rome. 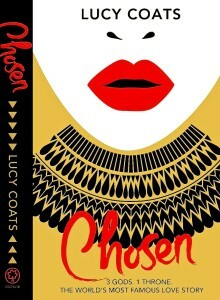 The weight of royalty hangs increasingly heavy on Cleo’s shoulders – and impossible, scary decisions lie ahead. What should she do about her unpredictable and moody scribe-spy lover, Khai? Will best friend Charm desert her for the mysterious soldier-girl, Iras? And what about the troublingly handsome young soldier Cleo meets on the way to retrieve her exiled father? Is Marcus Antonius the prophesied one who will ultimately be the death of her? Most important of all though, can Cleo and her untried troops pass the Egyptian gods’ final test? Can they find a way to defeat the unnatural army of the Burnt-souled Dead stalking the streets of Alexandria? Or will all of Egypt run with the blood of unhallowed and infernal sacrifice? This captivating novel of love, power, magic and destiny in Ancient Egypt continues the untold story of the young Cleopatra on her path to becoming the greatest Pharaoh of all time, which began with CLEO.